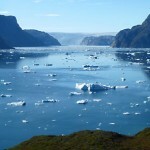 Visit the fantastic UNESCO World Heritage site Ilulissat Icefiord on a short 4-5 day trip. You can combine this trip to Ilulissat with any of our routes in South Greenland. Ask for details. Ilulissat means iceberg in Greenlandic and the town is beautifully situated at the mouth of the almost 60 km long ice fjord, filled with enormous icebergs from the most productive glacier in the northern hemisphere, Sermeq Kujalleq. 4,600 people live today in Ilulissat but the large number of dogs that also living there helps to emphasise how important dogsled is for transport, even in a large modern town. The journey is designed so that it is suitable for anyone who enjoys outdoor activities. No special physical condition is required to participate. 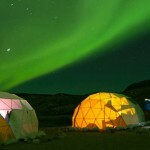 The stay in Ilulissat will be on your own. However, you will have permanent assistance from Tasermiut staff. Flight from Reykjavik or Copenhagen to Ilulissat. Reception at Ilulissat Airport and transfer to the hotel for check-in. 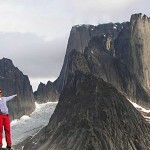 Ilulissat city tour: Visit of the city with a guide who will describe the history of Ilulissat and its buildings. The tour will start from the old part of town where there are the buildings of the first Danish settlement with the harbour, the church and the museum. Accommodation at Hotel. Twin / Double room with private facilities. Ilimanaq is a settlement in the Municipality of Qasigiannguit (south of Ilulissat) whit a population of approx 80 inhabitants. The settlement was founded around 1741 and the community’s main occupations are still hunting and fishing. 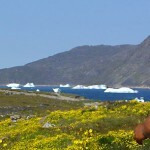 The boat tour to Ilimanaq is an opportunity to visit an old and almost untouched inuit settlement and, at the same time, sail among the massive icebergs that lay at the mouth of the Ilulissat icefjord. The boat leaves Ilulissat harbour at 10 am with direction Ilimanaq. Before reaching the village the boat will cross the famous Ilulissat icefjord with its massive icebergs. In Ilimanaq you will have a couple of hours where you can visit the village in particular the little church that was built in 1904. Lunch with a greenlandic family that will cook the traditional dish called Suasast – a soup with rice, vegetables and meat (usually seal) or fish -. During lunch, Regine will tell you stories and fact about the village the way it was and the way it is. At 2pm the boat will sail back to Ilulissat crossing the icefjord again. Arrival in Ilulissat is around 4pm. Accommodation at Hotel. Twin / Double room with private facilities. * Note that there is an option to stay one more day in Ilulissat. After breakfast at the hotel, day at leisure in Ilulissat for optional excursions. Accommodation at Hotel. Twin / Double room with private facilities. 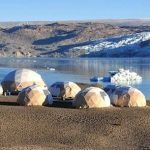 Boat tour to Eqi Sermia Glacier: the Eqi Sermia Glacier is located approx. 100 km north of Ilulissat. It’s called the “calving glacier” because ice breaks off from it more frequently than other glaciers. It is also the easiest place from which you can get onto the inland ice. The Eqi glacier is 100 meters high. It is 5 kilometers from edge to edge. Small pieces of ice break off from the glacier at regular basis. In the 50th century, the famous French polar scientist Paul-Emilie Victor came to this area to study the inland ice. The excursion to the Eqi Sermia glacier gives you the opportunity to get very close to the inland ice and to see the calving phenomenon. 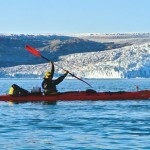 The tour starts from Ilulissat harbor around 8 am. The boat journey to the glacier depends on the boat, the weather and sea conditions but it’s approximately 3/4 hours. At the glacier the boat stops approx 500 metres from it and there you will have time to admire the calving while drinking a cup of coffee. Lunch will be served at the restaurant in Ataa (a small Inuit settlement that was abandoned in 1960). In Ataa, there will be approx 2 hours where guests can have lunch and visit the settlement. Return to Ilulissat is expected around 6pm. Duration: 9 hours 30 minutes (approx.) Price per person: 1,995dkk (275€) The price includes lunch and the transfer by bus from the accommodation to the harbor and return. IMPORTANT: The indicated prices are per person unless otherwise stated. Prices may change without prior notice due to specific conditions at the time and place of the excursion. Please note that not all excursions are available during every tour-programme that includes this destination. Please contact Tasermiut Office to get more information. Breakfast at the hotel. Transfer to the airport. Flight from Ilulissat to Reykjavik or Copenhagen. 4 or 5 days. Departures from Copenhagen and Reykjavik.